Journal of Nanjing Agricultural University, 2019, 42(2): 253-260. 童月霞, 胡晓璇, 程宗明, 等. 苹果NBS-encoding基因对斑点落叶病菌侵染的表达响应[J]. 南京农业大学学报, 2019, 42(2): 253-260. Abstract: [Objectives] This paper aimed to analyze the characters of differentially expressed NBS-encoding genes in 'Starking' and to explore the potential functional genes in the process of apple Alternaria blotch pathogen infection. [Methods] In this report, the differentially expressed NBS-encoding genes were obtained by screening RNA-seq data of 'Starking' infected by apple Alternaria blotch pathogen. In addition, the physico-chemical properties of these genes were analyzed using the websites of ProtParam, Pfam, SMART, etc.. The expression heat map was built by R studio software to analyze their expression patterns. The phylogenetic tree of apple NBS-encoding gene family was constructed by FastTree 2 software. The Ka/Ks ratios of these NBS-encoding genes were calculated by using MEGA 6.0 to study the selection pressure during the evolution process. At the same time, the co-expression network of the NBS-encoding genes was constructed by Cytoscape software. [Results] A total of 19 differentially expressed NBS-encoding genes were obtained based on the RNA-seq data. According to the expression profiles of these genes, we found that three genes(GenBank accession No. MDP0000259862, MDP0000304378 and MDP0000292810) might play a crucial role in response to the infection of apple Alternaria blotch pathogen. In addition, it was also found that the 19 NBS-encoding genes were distributed in 15 clades in the phylogenetic tree of all NBS-encoding genes. The average Ka/Ks ratios of clade 10, 12, 14, and 15 were all greater than 1, indicating that the genes of these clades were subjected to positive selection, especially genes of accession No. MDP0000210357, MDP0000751628, MDP0000147704 and MDP0000372663. However, the other 15 NBS-encoding genes with Ka/Ks values less than 1 were under purifying selection. Besides, there were 16 NBS-encoding genes in the same one co-expression network, in which genes of accession No. 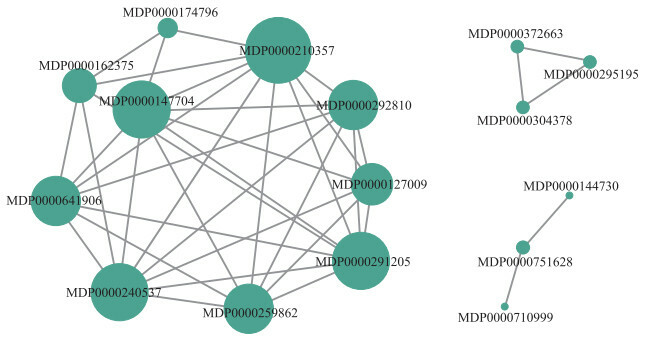 MDP0000210357, MDP0000240537 and MDP0000291205 played important parts in the co-expression network. 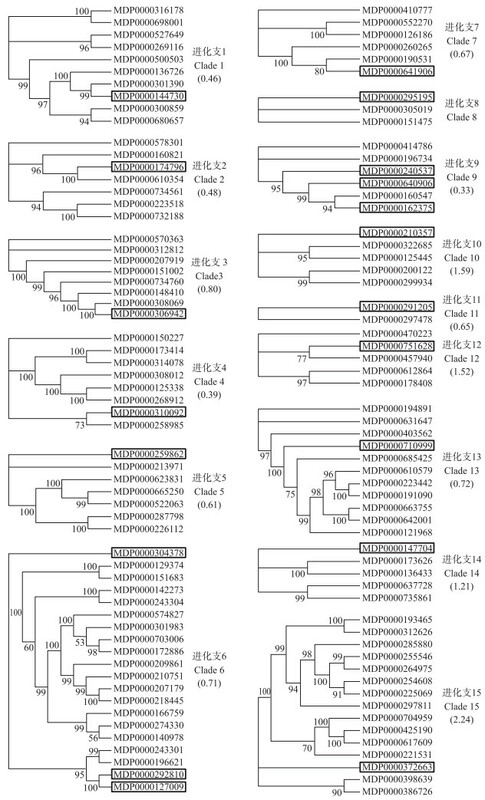 [Conclusions] There were 19 apple NBS-encoding genes involved in response to the infection of apple Alternaria blotch pathogen, in which genes of accession No.MDP0000259862, MDP0000304378, MDP0000292810, MDP0000210357, MDP0000240537 and MDP0000291205 could be used as candidate genes in apple breeding resistant varieties. 注:*数据来源于文献。Data are derived from reference . 图 1 差异表达NBS-encoding基因在‘红星’接种苹果斑点落叶病菌过程中的表达热图 Fig. 1 Expression heatmap of differentially expressed NBS-encoding genes during the infection in'Starking'with apple Alternaria blotch pathogen RPKM:每百万reads中来自于某基因每千碱基长度的reads数Reads per kilobase of exon model per million mapped reads. 图 2 19个差异表达NBS-encoding基因的系统进化树 Fig. 2 Clades of 19 differentially expressed NBS-encoding genes 1)方框内基因为19个差异表达NBS-encoding基因; 2)括号内数值表示各进化支中基因的平均Ka/Ks值; 3)由于系统进化支8中Ka/Ks值无效, 因此没有标注。 1)The genes in the box are 19 differentially expressed NBS-encoding genes; 2)Bracketed values are average Ka/Ks ratios between the genes in each clade; 3)The Ka/Ks ratio of clade 8 is not shown because of the invalid ratio. 图 3 19个差异表达NBS-encoding基因的共表达网络 Fig. 3 Co-expression network of 19 differentially expressed NBS-encoding genes 节点代表基因; 节点大小代表渡值的大小; 节点之间的边缘线代表基因共表达间的相关性。 Nodes represent genes, and node sizes represent the magnitude of the degree value. Edge lines among nodes represent the correlation between gene co-expression. Song X. Identification and expression analysis of NBS genes in the apple[D]. Qingdao: Qingdao Agricultural University, 2013(in Chinese with English abstract). Abe K, Iwanami H, Kotoda N, et al. Evaluation of apple genotypes and Malus species for resistance to Alternaria blotch caused by Alternaria alternata apple pathotype using detached-leaf method[J]. Plant Breeding, 2010, 129(2): 208-218. 胡同乐, 曹克强, 王树桐, 等. 生长季苹果斑点落叶病流行主导因素的确定[J]. 植物病理学报, 2005, 35(4): 374-377. Zhu L, Ni W, Liu S, et al. Transcriptomics analysis of apple leaves in response to Alternaria alternata apple pathotype infection[J]. Front Plant Sci, 2017, 8: 22. Grossman A, Mittrücker H W, Nicholl J, et al. Cloning of human lymphocyte-specific interferon regulatory factor(HLSIRF/hIRF4)and mapping of the gene to 6p23-p25[J]. Genomics, 1996, 37(2): 229-233. Hu X, Zhong Y, Huang K, et al. Differential expression of 12 NBS-encoding genes in two apple cultivars in response to Alternaria alternata f. sp. mali infection[J]. Canadian Journal of Plant Science, 2017, 98(2): 21-25. Li C J, Liu Y, Zheng Y X, et al. Cloning and characterization of an NBS-LRR resistance gene from peanuts(Arachis hypogaea L.)[J]. Physiological and Molecular Plant Pathology, 2013, 84(1): 70-75.